Aima Saint Hunon is a well received, up and coming artist with a very promising future. When Paul Cavanagh had a chance encounter with Aima at a gallery opening in 2011 in Shanghai, he discovered she had an interest in having some of her sculptures cast in bronze. While talking together, Paul Cavanagh also learned that while in China, Aima worked along side world renowned Chinese sculptor Xie Aige, whom Cavanagh also knows. That unforeseen meeting began what has been an ongoing, multifaceted relationship between Aima and our Asian affiliate Sculpture Source Asia. In 2012, Paul Cavanagh and Aima began planning an exhibition of the pieces she wished to cast in bronze. Cavanagh is co-owner of the Philippe Staib Gallery in Shanghai and he proposed having the show there. He also began to discuss with Aima the choices she would have for having her sculptures cast. They decided on the foundry in Nanchang because Aima had heard the quality was equal to any other foundry. Aima also indicated that the economic value China offered her was an important factor in determining her decision. The foundry in Nanchang, known for their bronze sculptures and bronze plaques, began making the molds and then the bronze castings in 2013. Aima stayed in Nanchang for two months learning the techniques of fine finishing and patina under the tutelage of Cavanagh. 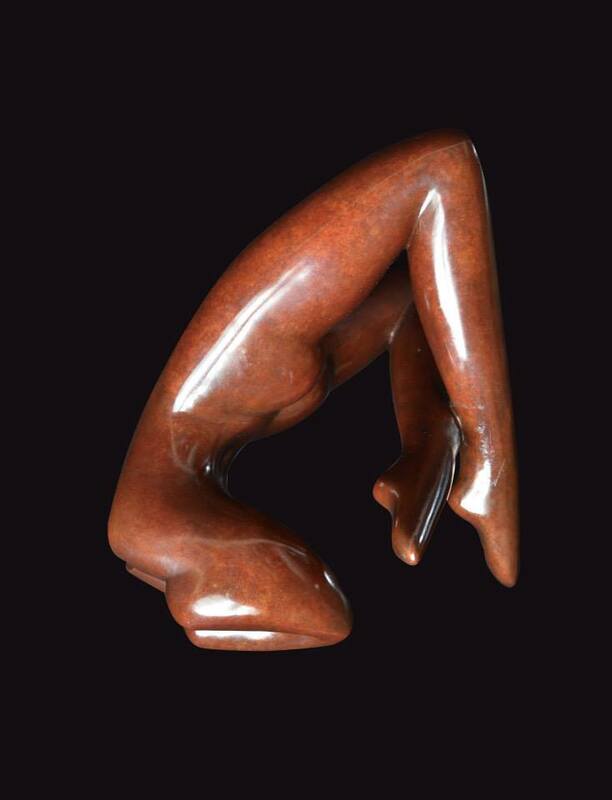 Aima has had formal training in sculpture and holds a professional diploma from the Olivier Serres Art School in France but she had never produced a bronze casting before. In time, Aima was able to rely on Paul Cavanagh’s knowledge and abilities. Aima learned quickly and her stunning, hued patinas are a good example of her intelligence infusing with her unique, creative abilities. 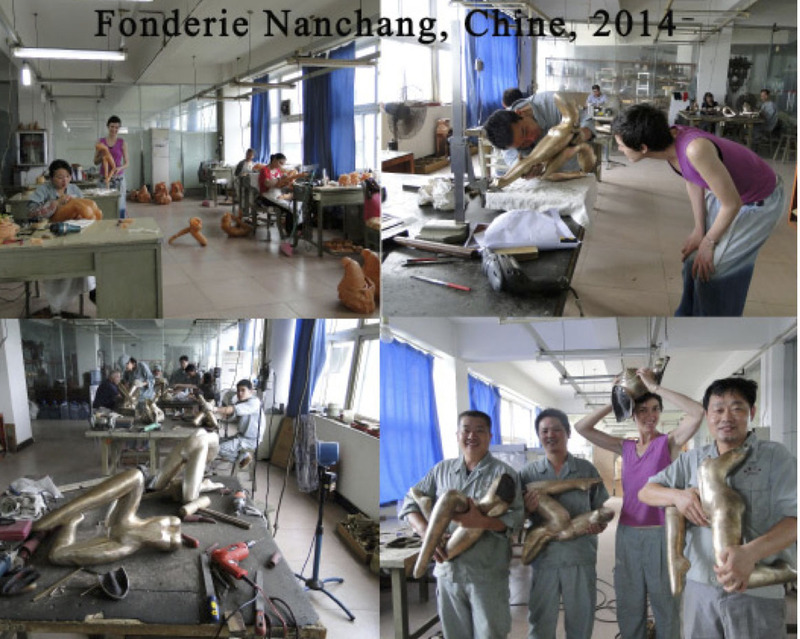 Aima Saint Hunon reviews and is very pleased with the work at the Nanchang foundry for her bronze sculptures in 2014. Aima had heard stories about the quality not being very high in China. To her delight, Aima found the quality of the casting was as good as anywhere in the world and far superior to anywhere in China. There were 28 sculptures for Aima’s show, all of various dimensions. All of the pieces were completed on time and finished expertly. Aima’s exhibition “Oh! LALA” was in the Philippe Staib Gallery in Shanghai from March 15 to May 11, 2014 to great success. Aima’s passion for her work and her unique talent show great promise for her future success. Aima splits her time between her studios in Shanghai and New York. She works in the mediums of sculpture, painting, ceramics, collage, print making, video, poetry and performance art. We continue to enjoy our relationship with such an aspiring, multi-talented artist.